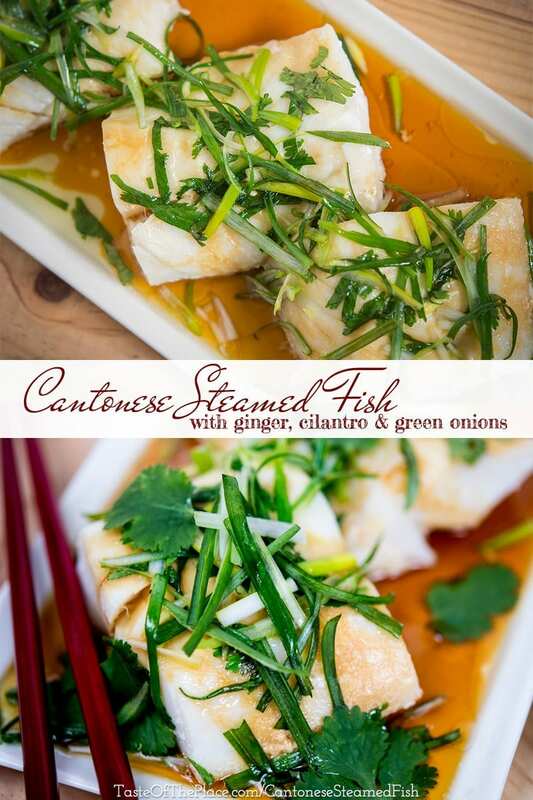 Flavors of ginger, cilantro and green onion make this light and easy Cantonese steamed fish a standout dish for a quick weeknight dinner, or the perfect side for a full Chinese meal. Moment of truth – I’ve always been kind of intimidated to cook Asian food! The unique (to me) ingredients, sauces, and techniques scared me away! Thank goodness for my friend Susan Ng from Susan’s Savour-It. 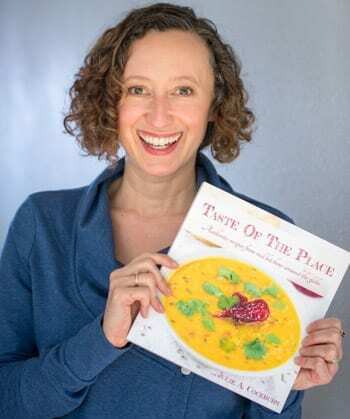 She’s come to my rescue with a series of wonderfully tasty, easy to prepare, and not-intimidating Chinese recipes for the brand new Taste Of The Place cookbook. 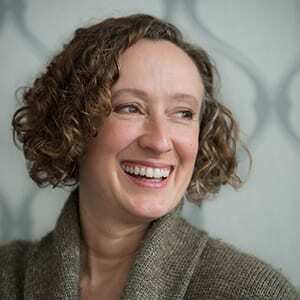 Thank you, Susan! 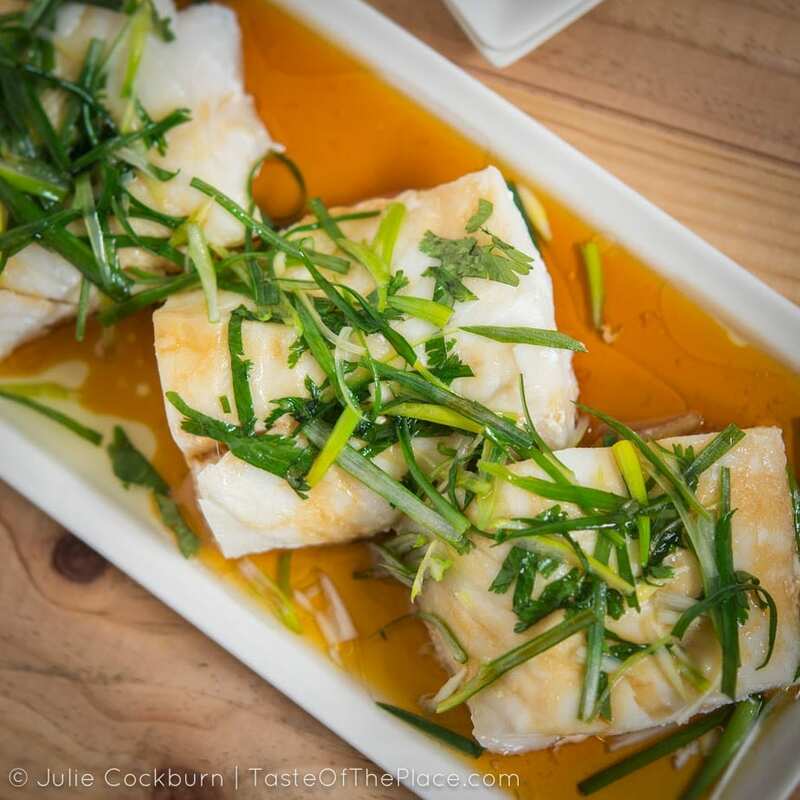 This particular recipe is for a super simple, flavor-filled, steamed fish that can be enjoyed as an appetizer or entree. Susan tells me that Cantonese cuisine is not complete without a dish of steamed fish, usually prepared whole and served in an oval dish. Opting to use frozen fish fillets, as she has done in this version, is convenient, just as delicious, and a cinch to prepare with no fish skin and bones to contend with at the table! 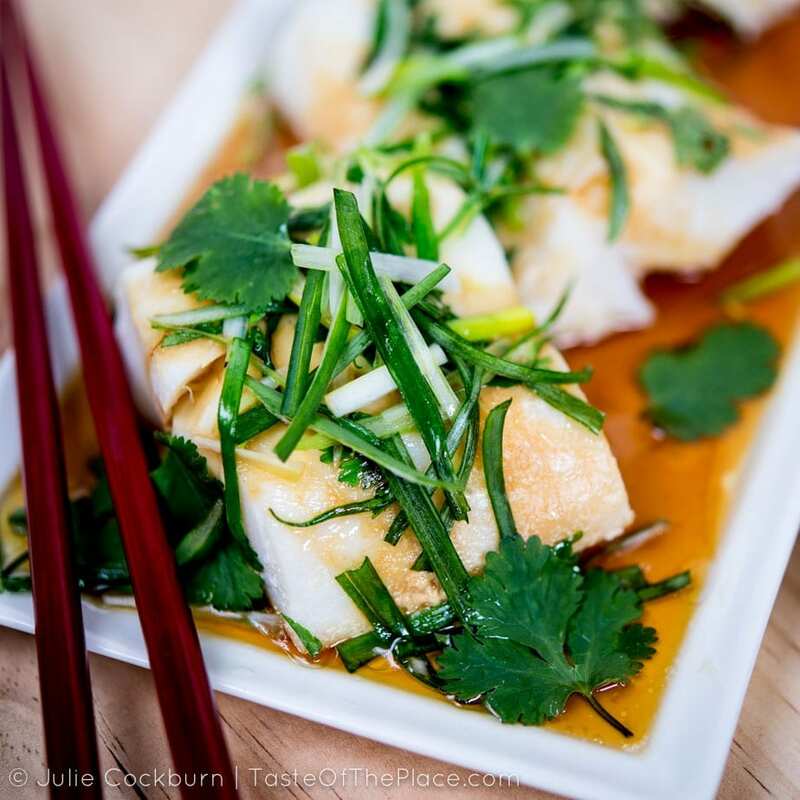 Flavors of ginger, cilantro and green onion make this light and easy Cantonese steamed fish a standout dish for a quick weeknight dinner, or the perfect side for a full Chinese meal. Recipe from the Taste Of The Place cookbook. Pour an inch of water in a wide skillet with a well fitting lid. Bring the water to a boil, then reduce the heat until just simmering. Cut the fish fillets into 2 to 3 inch pieces. Lay the pieces on a heat-proof plate that will fit easily inside the skillet (this same plate can be used for serving, if you like), or a steamer insert. Drizzle the cooking wine over top, sprinkle with white pepper, and scatter over ginger strips. Place the plate or steamer insert into the skillet or pot with the simmering water, cover with the lid, and steam until the fish is flakey and almost opaque throughout. The time this takes will vary significantly depending on the thickness of your fish – anywhere from 5 to 12 minutes. Carefully remove the plate or steamer insert, discarding the water and ginger strips. It will continue cooking after it’s removed from the heat, so be sure to pull it from its steamy pan when the center still has a touch of translucency. If using a steamer insert, move the fish to a serving plate. Scatter the onions and cilantro over the fish. Heat the canola oil in a small skillet until just beginning to smoke. Carefully pour the hot oil over the steamed fish. Sparingly drizzle everything with the seasoned soy sauce and sesame oil.